Last year, I made a bet with Warren Buffett that I can select a group of stocks that can “beat the market”. This was inspired by Buffett’s previous bet with a hedge fund manager, which ran for a decade. Buffett made a bet that the hedge funds cannot do better than an index fund. And Buffett won the bet. I believe that many investors did not understand why Buffett won the bet. There is a lot of idolizing of index funds, when their main weapon is the low cost nature and low turnover. As dividend growth investors, we have known this simple truth for decades, and taken full advantage of it. When you buy individual securities, you have a one time cost, followed by no charges in the future. In today’s day and age, you can purchase stocks for free, and not pay anything to hold on to them. The real reason why the index funds did better was because they have lower costs and lower turnover compared to hedge funds. With my bet, I am going to show that you do not need to own index funds. You can do well even with a portfolio of individually selected stocks, as long as certain basic factors are taken into consideration. These factors include keeping costs low, keeping turnover low, and having a long-term focus. For example, if an index fund held shares in Coca-Cola (KO), they would charge investors a small fee of 0.05% - 0.10%/year to held the stock through the wrapper. If a hedge fund held these shares for you, they would charge you a 2% fee per year, as well as 20% of any profits made on top of that. If the money is held in a fund of hedge funds, you are guaranteed to pay even more in fees. If you add in the potential for behavioral mistakes where you buy and sell Coca-Cola stock at inopportune times,( aka “timing the market”), you will do even worse than the investor who simply bought and held Coca-Cola stock. Of course, if you bought shares of Coca-Cola for your own account, without paying a commission and without paying a fee to anyone to hold the shares for you, you would come out ahead. Ironically, many index investors would have also lost the bet to Warren Buffett. That’s because they don’t just own S&P 500 index funds in their portfolios. They also hold international stocks, emerging market stocks, commodity index funds and fixed income index funds to name a few asset classes. The commonly used asset allocation of equally weighting US Stocks, Foreign Stocks and US Bonds would have also lost the bet with Warren Buffett between 2007 and 2017. If you paid a high fee to someone to select index funds for you, you will have lost the bet to Buffett as well. If you do costly rebalancing every year, you will incur extra costs that will reduce your returns and increase your tax liabilities. I am going to shed some light on these factors, by making my own ten year bet with Buffett. Of course, Buffett is not really part of this bet, as this is mostly an intellectual exercise from an unknown do-it-yourself investor. I am pretty sure that Buffett doesn’t even know I exist. I also included a few other bloggers in the bet in order to make it more interesting. My main premise on doing this bet was to challenge some assumptions, and challenge labels such as “active” or “passive” etc. I am also challenging the incorrect statement that index investing is the only right way to invest. There aren’t any right or wrong investing methods. The best method of investing is the one that lets the individual hit their goals and objectives, and the one they can stick to through thick or thin. In my case it is Dividend Growth Investing, which has helped me achieve financial independence in a decade. I also view this bet as a learning exercise, because of its nature. The learning exercise for me would be revising the original post and assumptions every single year, and determining assumptions that have changed since then. It is always helpful to write down reasons behind investments being made, in order to check up on the thesis in the future, and identify potential room for improvement. This is how I grow as an investor. I am essentially selecting a group of companies that I cannot sell for a decade. This limitation makes me want to be careful about the type of investments I am selecting. After all, I want to select companies that have a high chance of being relevant in a decade, while also delivering great returns to investors over the next decade as well. This requirement also caused me to think in terms of portfolio construction and think about alternative scenarios in case companies get acquired, merged or split-off/spun-off divisions. Finally, I had to think about dividends and their reinvestment, as well as how to deal with acquisitions in cash. The nature of US business is very dynamic, which is why it is very possible that the list in 2027 will look very differently from the list in 2017. To make it even more interesting, I wanted to select the companies for this 10 year bet in a way that is accessible for anyone that may be interested in investing. In other words, I wanted a list of companies that anyone can identify and select, without having to do any work and calculate any ratios or read a single page of annual reports. 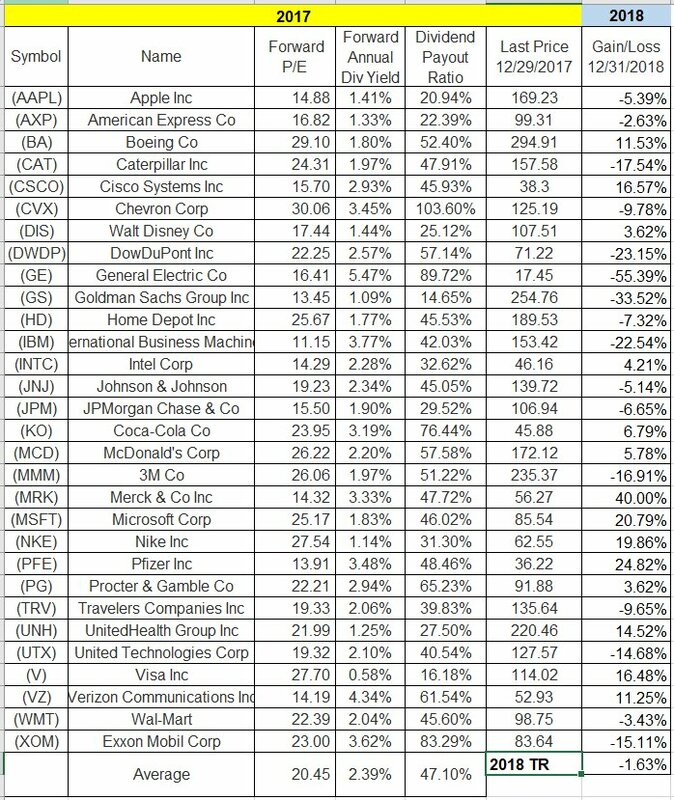 This is why I selected the list of companies in the Dow Jones Industrials average as of the end of the year in 2017. The 30 companies in Dow Jones Industrials Average are selected by a committee of journalists at WSJ and analysts from Standard & Poor’s. These individuals select blue chip companies that are representative of the US economy. 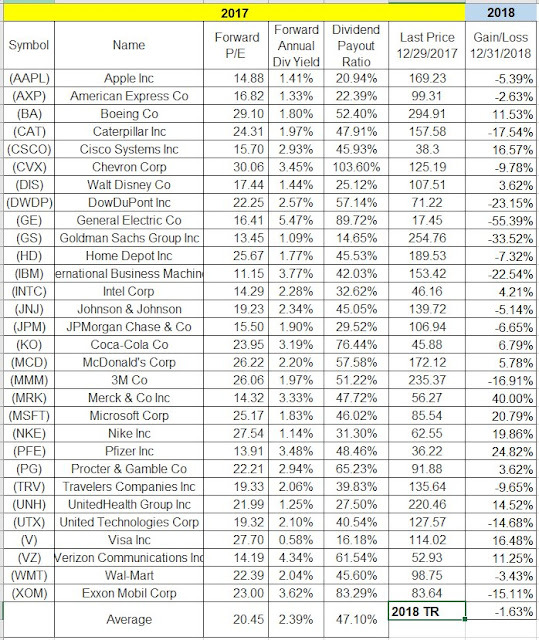 The performance of these 30 companies relative to S&P 500 and Total Stock Market index shows that you do not need thousands of stocks to be diversified. You can get a similar level of diversification with 30 – 60 securities that you can get with 500 or 3500 securities. Ironically, most capitalization weighted indices such as S&P 500 have at least half of their weight in the largest 50 securities. Which means that these securities have as much weight as the remaining 450. Some investors believe that by buying these 30 companies, I am engaging in stock picking. Somehow the word “stock picking” is used with a negative connotation. I actually like it and embrace it. That because the people who choose to invest in S&P 500 over an index of international stocks or small company US stocks are essentially stock pickers, who are claiming that the 500 or 3500 companies they selected are better than other portfolio combinations. They are just picking indices, rather than stocks, while claiming moral superiority over others in the process. I decided to equally weight all 30 of them, reinvest dividends automatically, and maintain the portfolio static. This means that I didn’t make any sales, even if the committee decides to delete a company, and replace it with another one. For example, the index committee did remove General Electric (GE) from the list in 2018, replacing it with Walgreen’s (WBA). As I stated in the original rules, I kept General Electric. I assumed that the investor allocated each of these companies equally at the end of 2017. Investors also believe that they should weight their investments based on free market float. Basically, companies with higher market capitalizations and a higher percentage of their shares outstanding that are not in insiders hands would have higher weightings. On the other hand, companies with low market capitalizations or companies with high level of insider ownership would have lower weights. If you do not believe that anyone knows anything about the future, you need to give each company an equal chance. This is why equal weighting makes better sense. The next assumption is that we are doing nothing else but simply reinvesting dividends. Given the fact that many brokers offer free trading, and given the passive nature of this portfolio, costs are at zero dollars. This is lower than most of the popular index funds out there, Fidelity being the prime exception..
A lot of investors assume that indexes are passive. In reality, they have a level of turnover, due to natural events such as mergers and acquisitions; however there are often arbitrary events such as the committee deciding to buy or sell securities due to certain criteria not being met ( capitalization for example). Given the fact that I will not sell ( unless forced through a cash buyout), but I will do absolutely nothing, I expect costs to be very low. I also expect to have zero behavior costs. When investors, institutions and indices remove a company, there is always a risk that the company they replace it with does worse than the original company. There is research out there, confirmed by my own experience, which states that the companies investors sell tend to do better than the companies they buy with the proceeds. The real advantage of index funds over other investment vehicles is their lower cost and lower turnover. It makes sense that if you hold shares of Johnson & Johnson and pay 2%/year to a greedy financial advisor, you will underperform a passive investor like me, who owns the stock directly and doesn’t pay anyone. It also makes sense that if you actively buy and sell shares, your costs will likely be higher as a result. Plus, there is evidence that you may do worse in comparison to someone who just bought and held due to transactional and behavior costs. Now that we know what the secret sauce behind index investing success is, I went ahead and made my selections at the end of 2017. So how did they do in 2018? Well, it turned out that these investments ended up losing money in 2018. However, they did better than S&P 500 in 2018 (meaning that their loss was smaller than the index). S&P 500 lost 4.38% in 2018, while the 30 selections I made lost 1.63%. I calculated the total returns for each company in 2018, using the website dividendchannel.com. Please check my math too. I also compiled the results for the other bloggers who wrote about the contest. Mr Carl from 1500days.com did much better by selecting some companies as well. His selections made 2.40% in 2018. I admire this writer a whole lot, despite the fact that we seem to have different backgrounds and different paths going forward. Ben from Sure Dividend selected the S&P Dividend Aristocrats ETF (NOBL) and did better than S&P 500, by losing only 3.30% in 2018. The Dividend Aristocrats Index only lost 2.70% however, which is another reason why it may make sense to buy the companies directly, versus buying them in an ETF form and getting charged an annual fee every year. Joe Udo from Retireby40 blog selected S&P 500 and lost the most money. It is funny that doing what was considered to be the smart allocation at the end of 2017 turned out to be the “worst” one for the year. It would be interesting to see what happens over the next nine years.